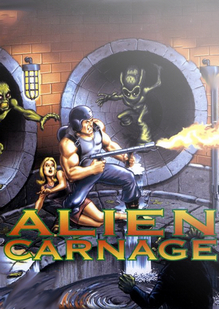 Alien Carnage was delisted from Steam on December 31st, 2015. It is currently available to download for free from 3D Realms. “Earth is on the verge of a takeover by aliens intent on turning humans into mindless slave zombies, who can be used in their conquest of the universe. Harry’s called into action to Space Station Liberty and given orders to penetrate the alien ship which has burrowed itself under a high-rise city. Kill in Color: Incredible VGA graphics and animation with 256 colors and over a dozen cinematic sequences. Game Over, Man: Huge “boss” aliens in each of the four missions. Page Turner: A compelling and sometimes-comical narrative prior to every mission. Area 51: Many secrets and bonuses to discover – lots of replay value. Save Your Game: Games saves, cheat mode, three skill levels and more.